Parkgate's existence is inextricably linked with the River Dee. 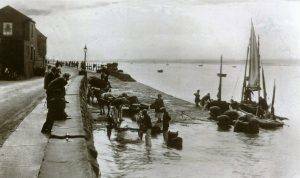 It is hard to imagine that until relatively recently the grass and marsh land in front of Parkgate was once a sandy beach with children building their sandcastles and a multitude of fishing boats bobbing on the water. Over the years metres of silt have been deposited on top of the sand and buried most of the sea wall. The interpretation boards & heritage plaques installed around the Parkgate Conservation Area explain Parkgate’s maritime heritage, describe the wildlife and identify buildings of interest. Use these to explore Parkgate and its history. 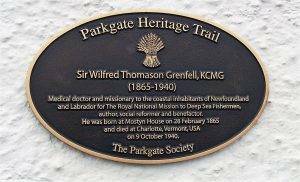 Follow the links at the bottom of the page to navigate to the brief history of Parkgate and to start the Heritage Trail. If you wish to get involved in Parkgate's community activities, please consider joining the Parkgate Society. Membership information can be found on the Join Us page. Or if you just wish to make a donation, please use the not for profit "MyDonate" link below.